Easter will be coming soon and Under Armour will be releasing an Easter colorway of the UA Curry 2. The shoe comes in grey color upper with mint green accents on the shoe and midsole. 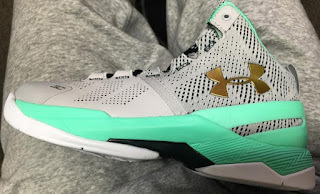 Nothing much can be said with regards to the colorway and the only time we will be remembering this is if Steph made a certain record wearing this shoe and maybe it's for UA to decide if they will release this.